Bar bouncers could face criminal charges in the death of Sammy Joe Pickel II, according to legal experts. "If someone throws a punch at you, you can’t kill them with a chokehold, and that’s seemingly what happened here," said Dan Recht, a Denver defense attorney. "The amount of force you use in self-defense has to be relative to the amount of force used against you." Sammy Joe Pickel II, 23, died early Tuesday morning. He had been clinging to life since Saturday, after friends say a bouncer placed him in a chokehold during a scuffle at Lodo's Bar and Grill in Westminster. Westminster police revealed Tuesday that they have surveillance video from Lodo's in Westminster that shows the beginning of the disturbance, but no one has been charged pending the results of the autopsy. "We need to find out the cause of death, which could take a couple of weeks" said Kate Kazell, a Westminster Police spokeswoman. The Lodo's in Westminster was closed Tuesday, and while management would not say why, Kazell confirmed that someone had called in a generic threat Tuesday morning related to what happened to Pickel. Family and friends say they do want someone held accountable, but they want it done right. "He was a huge teddy bear," Suzette Meacham said about her boyfriend of almost three years, 23-year-old Pickle. "He had so many friends. He was so caring." Meacham said they were planning a life together. "We have an apartment together. We just got a dog together," she said, starting to cry. "We were talking about children and planning the rest of our lives." But now, she said, that life is over. "They [doctors] told me he is brain dead and that there's no possible way that he will ever wake up again," Meacham said to Denver7 on Monday. Saturday night at Lodo's Bar and Grill in Westminster, Meacham said a girl slapped Pickle on the buttock. "I told her that wasn't cool, and she came back with three guys," said Meacham. "They pushed Sam and then four bouncers came over and saw him with his hands up for protection and jumped on him." Meacham said that one of the bouncers put her boyfriend in a chokehold until he passed out and then held on. 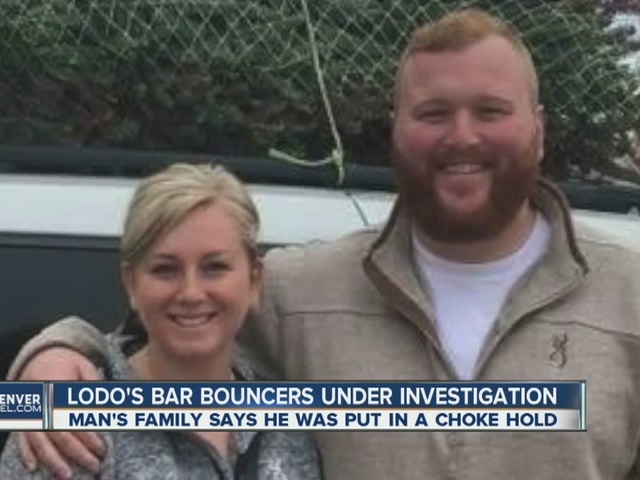 "Then the bouncer that had him in the choke hold continued and had him in the choke hold for at least a good 3 to 5 minutes," she said. Westminster police said by the time they arrived, Pickle was unconscious and taken to the hospital with critical injuries. "There's a big group of people upstairs praying for him right now," said Alex Nelson, Pickle's best friend who was with the couple shortly before it happened. "I understand the bouncers, the doormen and stuff are there for our safety. It's just crazy that the roles got reversed this time. And they're the reason that my friend's going to lose his life," he said the day before his friend died. Police said they are investigating, but it is too soon to know what charges, if any, will be filed. "For me, that's murder," said Kirk Milliken, Pickle's stepfather, who had been holding out hope that Sam would survive. "I want someone held accountable for this." Milliken said he did not believe reports that Pickle swung at a bouncer, but in any circumstance, a chokehold is not appropriate for a bouncer to use. Lodo's manager would not comment Monday, but said they are cooperating with police. Lately, a growing number of police departments are banning or limiting officers' use of chokeholds, and Colorado lawmakers are considering a law that would ban police chokeholds statewide. None of the bouncers were off-duty police officers, the manager said. "They hire anybody off the street that looks big and a good size to handle anybody. It’s sad that all four of them thought they had to manhandle my boyfriend," said Meacham. "I just can't imagine life without him." Recht said without knowing all the details about what happened, it is possible the bouncers, even if they did not intend to kill Pickel, could face charges of criminally negligent homicide or manslaughter. "I don’t think the average person on the street realizes that a chokehold can easily kill someone," said Recht. "They (the bouncers) should have known that. I don’t know that they did know that. I don’t know how well they were trained."